The Strathnairn Action Group was formed in November 2014 as a response to the recent flood of wind farm and wind energy derivative infrastructure applications (such as larger electricity pylons, widened roads and forestry tracks) being proposed in our area. The Action Group has limited its composition to a set of eighteen volunteers so as to remain manageable, but beyond SNAG there is a much wider constituency of residents who are both supportives and partcipatory in its work. it would increase visible turbines from roads and residential properties in Strathnairn from 20 at present to around 80, with the community being surrounded by over 130 turbines. 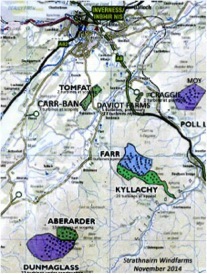 Strathnairn’s landscape would then be significantly industrialised and degraded. There is a strong feeling in the Strath that enough is enough. There are several frameworks, widely accepted internationally, by which ‘cultural’ impacts can be considered alongside physical and economic impacts of change. Three are briefly noted: risk-benefit analysis, the three pillars of sustainability and the four types of ecosystem services. The challenge is to compare things in different ‘currencies’ – e.g. economic vs cultural. The ES has not undertaken a fully comprehensive analysis in this respect. SnAG response to Consultation for Planning Onshore Wind Energy in Highland. Residents may use this information when compiling their own comments.